Support for Azure Data Lake Store (ADLS) is now available in Azure Analysis Services and in SQL Server Data Tools (SSDT). Now you can augment your big data analytics workloads with rich interactive analysis for selected data subsets at the speed of thought! Business users can consume Azure Analysis Services models in Microsoft Power BI, Microsoft Office Excel, and Microsoft SQL Server Reporting Services. Azure Data Lake Analytics (ADLA) can be used to run U-SQL batch jobs directly against the source data, such as to generate targeted output files that Azure Analysis Services can import with less overhead. Azure Data Lake Analytics (ADLA) can process massive volumes of data extremely quickly. Exporting approximately 2.8 billion rows of TPC-DS store sales data (~500 GB) into a CSV file took less than 7 minutes and importing the full 1 TB set of source data into Azure Analysis Services by using the Azure Data Lake connector took less than 6 hours. 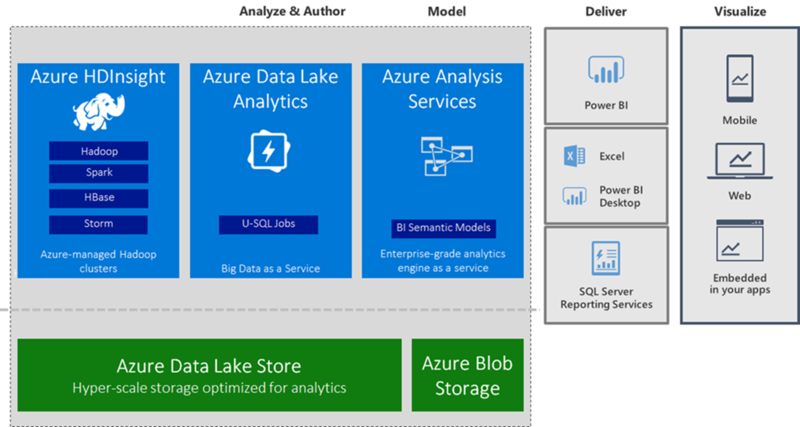 These results highlight Azure Data Lake as an attractive big-data backend for Azure Analysis Services. For more details about the preparation of source data in Azure Data Lake and importing it into an Azure Analysis Services model, see the Using Azure Analysis Services on Top of Azure Data Lake Storage on the Analysis Services team blog.